Thomas Gates was a son of John and Rebecca Gates. He was born at Derrymeen, Coalisland about 1893. Around 1914, Thomas emigrated to Australia. He was 21. 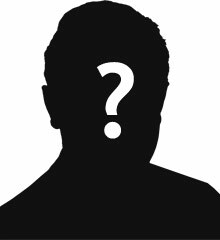 He worked as a farm labourer. He enlisted at Kingaroy, Queensland on 21 Sept 1915. 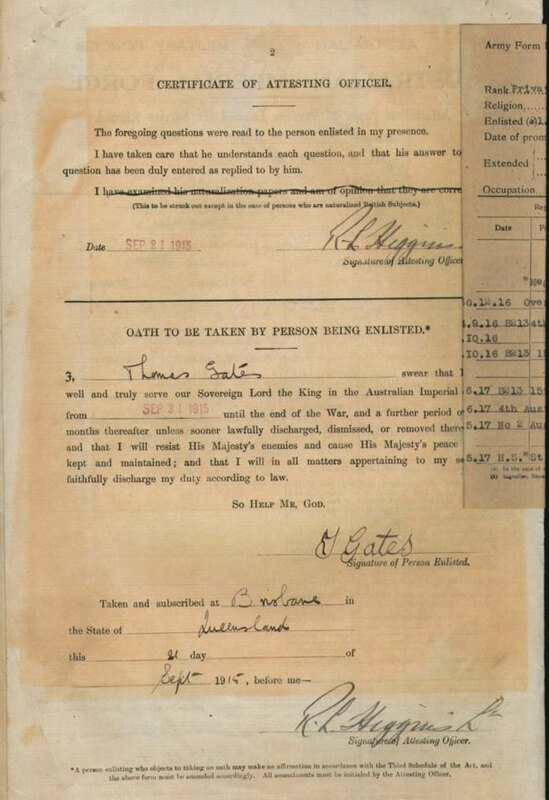 Private Thomas Gates was posted to the 15th Battalion of the Australian Infantry. On 30 May 1917, he was transferred to England where he was admitted to Northampton War Hospital with influenza. By t September 1917, he was back in France. 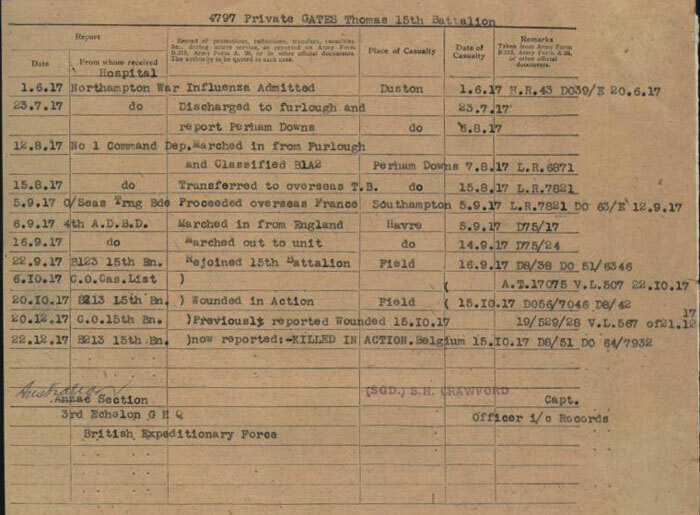 On 15 October 1917 Private Gates was reported wounded in action. On 20 December 1917, after previously being reported wounded, Private Thomas Gates was now reported as Killed In Action. Private Thomas Gates was killed in action in Belgium on 15th October 1917, age: 24. Thomas Gates was a son of John and Rebecca Gates. He was born at Derrymeen, Coalisland about 1893. Family: John Gates (born about 1861), Rebecca Gates (born about 1864), William John Gates (born about 1887), Samuel Gates (born about 1888), Rebecca Gates(born about 1890), Matthew Gates (born about 1892), Thomas Gates (born about 1894), Robert Gates (born about 1896),Margret Gates (born about 1900), David Gates (born about 1902), Alexander Gates (born about 1906). By the time of 1911 census, Thomas no longer lived with the family. The family now lived at Corrainy, Drumaspil, Tyrone. It's possible he was working as a servant for the Douglas family at house 1 in Tulnagall, Crossdernot, Tyrone (see references). Around 1914, Thomas emigrated to Australia. He was 21. He worked as a farm labourer. He enlisted at Kingaroy, Queensland on 21 Sept 1915. Private Thomas Gates jaws posted to the 15th Battalion of the Australian Infantry. The relatives of Private M Gates, 6th Inniskilling Fusiliers, who is at present at the Dardanelles, have received a letter from him stating that he is at present in good health and asking to be remembered to all his old friends. Private Matthew Gates, 6th Battalion Royal Inniskilling Fusiliers, writing from the eastern front to his sister at Park Road, Dungannon says he is well and hopes all are well at home. He has not received any of the parcels yet, but as soon as he gets them he will let them know. He heard from Tom who has enlisted also. Private Samuel Gates, 9th Battalion Royal Inniskilling Fusiliers, writing from the western front to his relatives at Park Road, Dungannon, says he is getting on quite well and wishes to be remembered to a number of his friends, whom he mentioned by name. 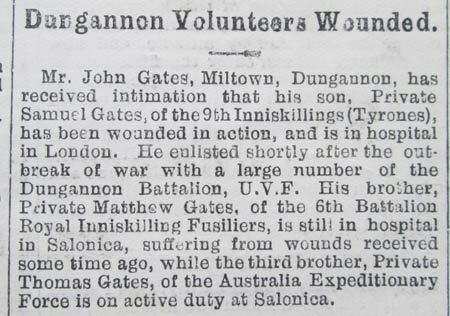 Two sons of Mr John Gates, Milltown, Dungannon, are also in hospital suffering from wounds – Private Samuel Gates, Royal Inniskilling Fusiliers (Tyrone Volunteers), being in hospital in London, while his brother, Private Matthew Gates, Inniskilling Fusiliers, is in hospital in Salonika. These casualties apparently occurred prior to the ‘big push’ as the intimations are dated 30th June. Mr John Gates, Milltown, Dungannon, has received intimation that his son, Private Samuel Gates, of the 9th Inniskilling (Tyrones) has been wounded in action, and is in hospital in London. He enlisted shortly after the outbreak of war with a lathe number of the Dungannon Battalion U.V.F. His brother, Private Matthew Gates, of the 6th Battalion Royal Inniskilling Fusiliers, is still in hospital in Salonika, suffering from wounds received some time ago, while the third brother, Thomas Gates, of the Australia Expeditionary Force is on active duty at Salonika. 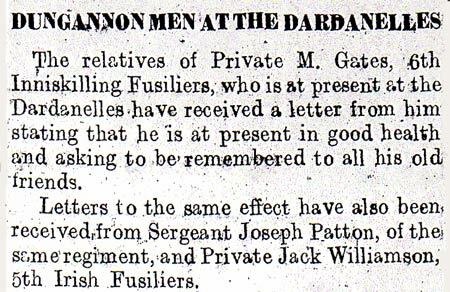 Private Samuel Gates, Tyrone Volunteers, returned to Dungannon suffering from shell shock sustained during the fierce bombardment prior to the advance in France. 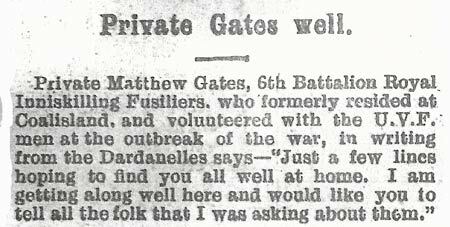 Private Samuel Gates, Tyrone Volunteers, has returned home to Milltown, Dungannon suffering from shell shock. On 24 September 1916, Thomas marched to Etaples from England. By 2 October, he had joined up with the 15th battalion. On 30 May 1917, he was admitted to Wimereux Australian General Hospital with influenza. He was transferred to England where he was admitted to Northampton War Hospital On 23 July 1917 he was discharged from hospital. Private Thomas Gates, Australian Infantry, son of Mr Matthew Gates, Brooke Street, Dungannon, wounded. Private Thomas Gates, Australian Infantry, who has been wounded and in hospital in Northampton, is the youngest of the three soldier sons of Mr Matthew Gates, Milltown, Dungannon. The following local men are officially reported wounded:- Company Sergeant Major G Belshaw, Private S Gates, Private W Millar (Stewartstown), Private W Moore, Corporal S Proctor (Coalisland), Private G McCauley, Sergeant G McKinstry, Private R A Montgomery (Coalisland), Private T Scott, Private S Hegarty, Sergeant W J Caddoo, Private J Brittian (Aughnacloy). By the 5 September 1917, he was back in France again. On the 22 Sept 1917 he rejoined 15th battalion. 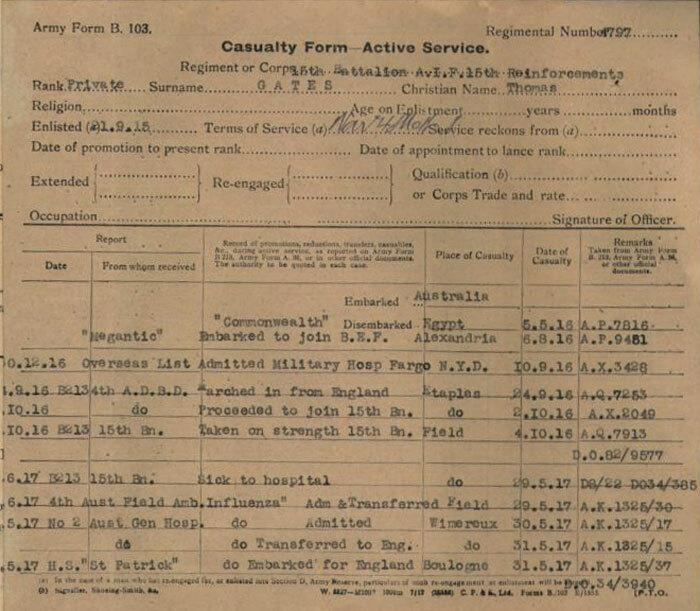 On 15 October 1917 Private Gates was reported wounded in action. On 20 December 1917, after previously being reported wounded, Private Thomas Gates was now reported as Killed In Action. Private Thomas Gates was killed in action in Belgium on 15th October 1917, age: 24. Private Thomas Gates, Australian Imperial Force, died of wounds, son of Mr John Gates, 19 Brooke Street, Dungannon. Two other sons of Mr Gates are on active service. 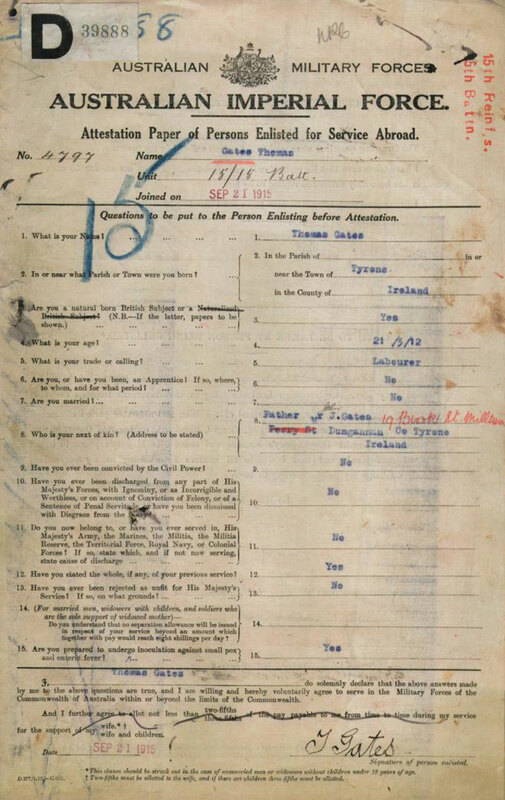 Mr John Gates, 19 Brooke Street, Dungannon, has received official intimation that his son, Private Thomas Gates, Australian Imperial Force, has died of wounds received in action. This soldier had emigrated to Australia and volunteered on the outbreak of war. Mr Gates' other two sons, Matthew and Samuel, are serving with the colours. His mother was listed as the recipient of his War pension.